When it comes to destinations in Vietnam, in compared with other famous tourist areas like Nha Trang, Phan Thiet (Phan Thiết), Vung Tau (Vũng Tàu),… Co Thach seems to be lesser known with wild, pristine beauty that is still new to both domestic and international tourists. Nonetheless, this destination is ideal for those people who want to explore something wild and avoid the hustle and bustle of the other crowded sites. 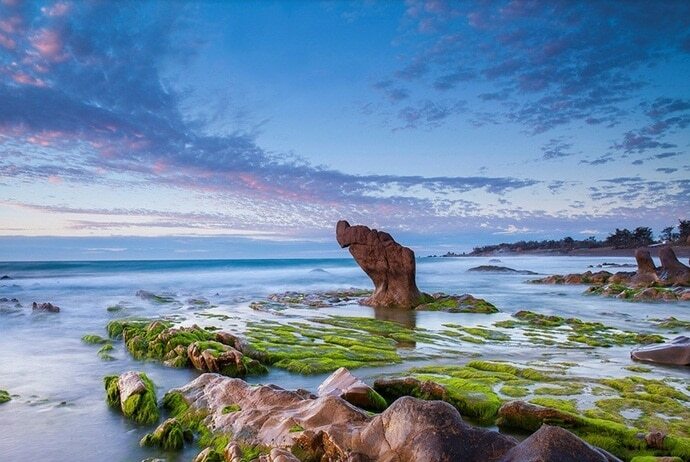 Co Thach Beach is a strange, wild and attractive tourist destination in Phan Thiet, Binh Thuan (Bình Thuận) province, Vietnam. The special attraction here is the rock with different colors and strange shapes. Here we will share with you the Co Thach Beach traveling tips that any visitor needs to know. If you are intending to come here, do not ignore anything. What Is The Best Time To Visit Co Thach Beach? 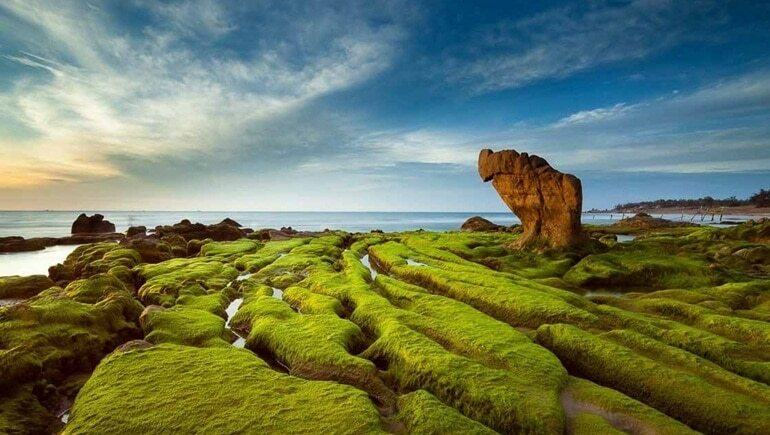 It is best that you come here in March because, at that time, all the big rocks in Co Thach wear a green moss coat. As light shines on, the color of the moss constantly changes, creating a wonderful scene. That is why this is called “hunting season” in Co Thach. If you miss March, you can come here from 16th to 18th of August because Nghinh Ong Festival (lễ hội Nghinh Ông) – the largest and most important festival of Co Thach takes place during this time. How To Get To Co Thach Beach? There are 3 ways to move to Co Thach conveniently and safely: coach, train, and motorbike. Starting from Saigon, you follow the direction of National Highway 1A to the Lien Huong (Tiep Phong) junction. Turn right and go about 3km to Co Thach. A small tip to keep in mind: If you want to ride a motorbike along the beautiful coastal road in Tuy Phong, you ought to follow the route: National Highway 1A – Duom Junction (Ngã 3 Duồm) (Hamlet 7 (xóm 7), Hoi Tam (Hội Tâm), Hoa Minh (Hòa Minh)) – turn right to Co Thach. From Saigon: At Mien Dong Bus Station (Bến Xe Miền Đông) and Le Hong Phong Bus Station (Bến Xe Lê Hồng Phong), there are many buses and coaches to Binh Thuan. When you get in the coach, you can tell the driver or the pickup person that you want to go to Co Thach Beach. They will drop you off when they arrive at Co Thach Beach. From Phan Thiet and Mui Ne: You also take the coach to Binh Thuan, get off at the point of Lien Huong Junction (Ngã Ba Liên Hương) and take the motorbike taxi to go to Co Thach. Motorbike taxi will charge you a price of 30.000 – 40.000VNĐ. From Hanoi and the northern and central provinces, you should go to Saigon or Phan Thiet and follow the instructions above. Where To Stay In Co Thach Beach? 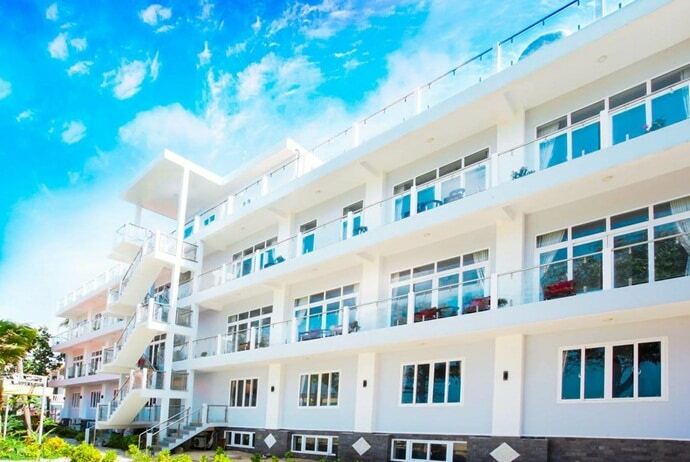 If you want to stay in the hotel, you can refer to some hotels such as Victoria Hotel (Cham Towel, Phan Rang, about 20km from Co Thach) or Ca Na Hotel (Ca Na Beach, about 25km from Co Thach). Co Thach Village Tourist Resort (Tel: 0623856015 / 08.38357963). Khai Hoan Hostel (Tel: 062. 3856043). Ngoc Hung Hotel (Tel: 0623 856 023). Song En Guesthouse (Tel: 0623 856 086). What Are Attractions InCo Thach Beach? Co Thach does not have many attractions, but it is enough for you to go out, visit and explore in 2 days. It is also called Hang Pagoda (Chùa Hang). 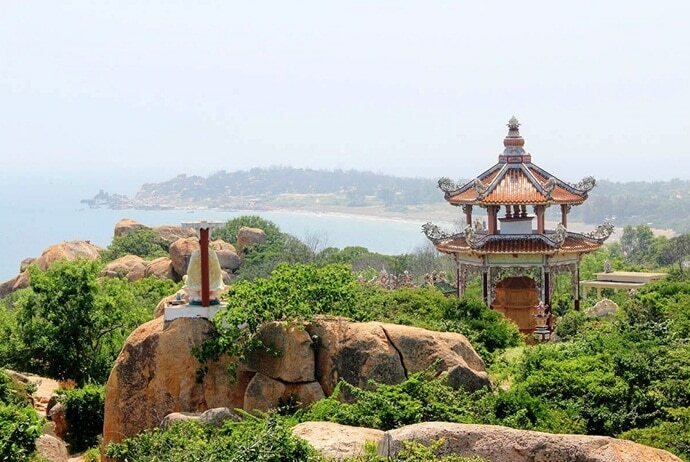 It has a unique Buddhist architecture and has beautiful views of the sea. This pagoda is a famous destination that you cannot ignore when traveling to Co Thach. The complex of Co Thach pagoda has existed for 180 years amond caves. There are temples and shrines in each cave. Stepping up onto each stone and creeping into each cave, you can show your respect to the Buddha and feel the solemnity here. Just like other tourist attractions, there are a lot of beggars and street vendors in Co Thach, so be sure to keep your belongings carefully. 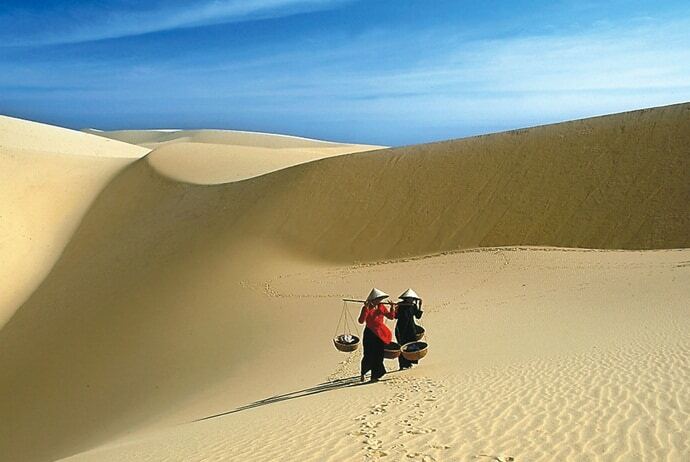 It is quite similar to the sand dunes in Mui Ne. You can play the sand slide and take pictures here. It is quite near Binh Thach sand hill, so you can walk or hike to this tomb from the sand hill. This unique and attractive destination is the perfect place for trekking and exploring caves. It is only 5km from Co Thach fishing village, and you should ask indigenous local people to know the way to get there. 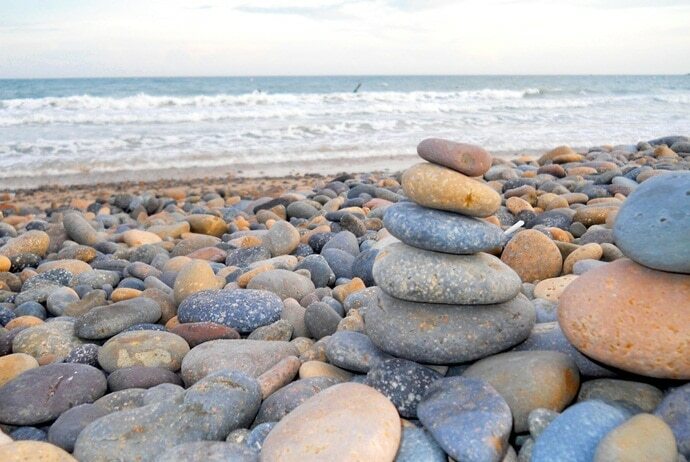 It is said that seven colored stones are the most attractive tourist attraction in Co Thach. Almost all tourists come to Co Thach to admire the beauty of these fanciful, unique and interesting rocks. Vinh Hao mineral water is renowned; however, not many people know about its origin which belongs to the mineral water spring in Vinh Hai Commue, Tuy Phong district, Binh Thuan province. 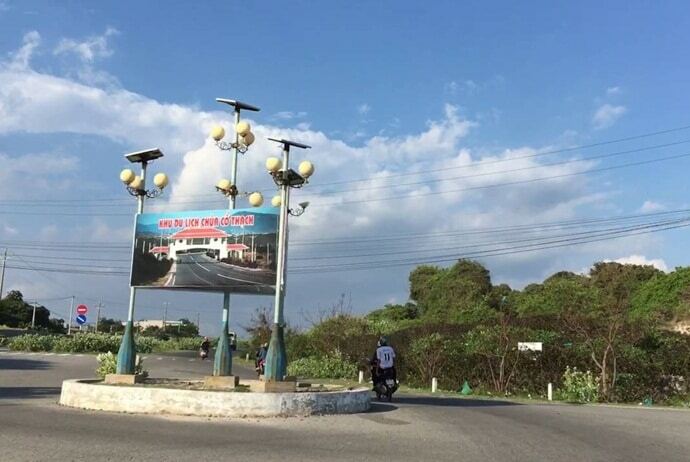 From Tuy Phong district center, you can go on the National Highway 1A about 7km towards Phan Thiet, pass Yeu Ngua Pass and Tao Mountain, and turn left about 1.5 km at the junction. This is where to see the Vinh Hao mineral spring. This mineral and mud bath resort is located in the middle of a cool, wild nature. You can relax your body completely in the mineral tub, which has the ability to beautify si, relax blood vessels and is very good for human health. Indeed, if you have a chance to visit Co Thach, do not skip this place. What to Eat In Co Thach Beach? Co Thach Beach is a coastal area so cuisine here is mainly seafood. The seafood is very diverse so you can enjoy the pleasure when eating seafood like shrimp, cuttle-fish, and fish. Foods in Co Thach Beach are delicious and crispy so they are very suitable for those who like to eat seafood. There are many restaurants with reasonable prices in Co Thach Beach, helping you enjoy tasty dishes at the restaurant here. If you want to prepare your own food, you can go to Co Thach Market (Chợ Cổ Thạch), Huong Lien Market (Chợ Hương Liên) or Co Thach Village (Làng Cổ Thạch) to buy fresh food. Co Thach Market is a bustling market with many food outlets. 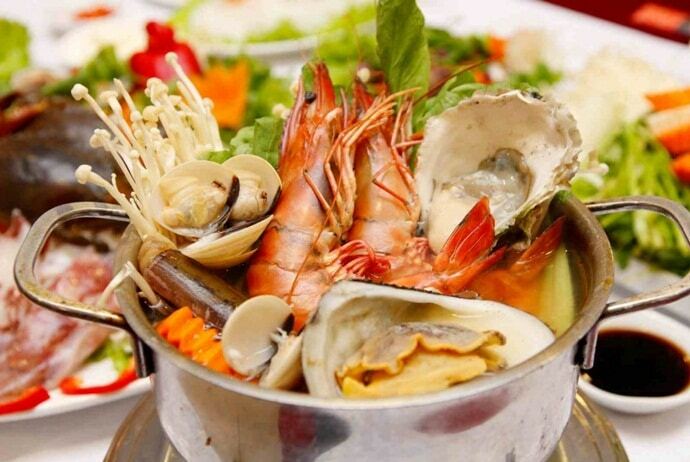 In the evening you can go to Co Thach night market to enjoy seafood and street foods. You can also shop souvenirs for family and friends here. The above are some helpful experiences we would like to share with you. Hope that this information will help you prepare a perfect trip to Co Thach Beach. Wish you have a fun and meaningful trip in Vietnam!